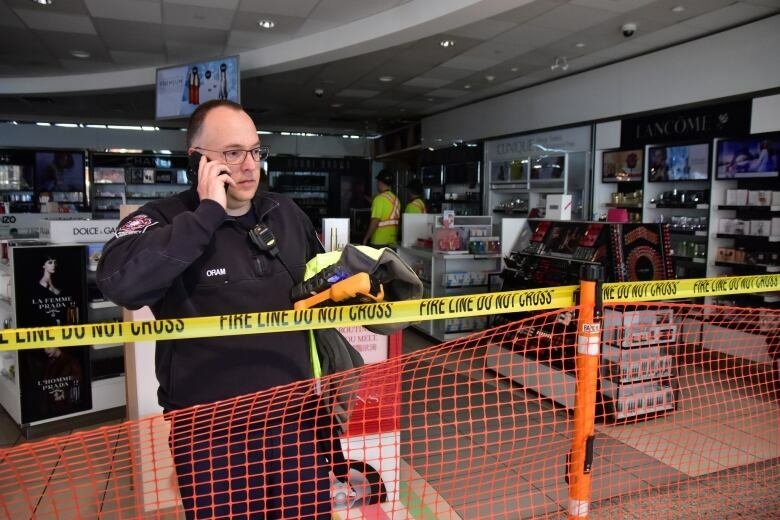 Operations have returned to normal at Toronto’s Pearson International Airport a day after a fire at Terminal 1 disrupted flights Sunday night. Travellers to the United States had been urged to check their flight’s status Monday morning before heading to the airport, as officials predicted ongoing delays and cancellations. By late morning, the airport’s official Twitter account announced that operations had returned to normal, including flights departing for the U.S.
“Nobody wants to be delayed; it was the end of March break,” Maria Ganogiannis, a senior communications adviser with the Greater Toronto Airports Authority (GTAA), which operates the airport, told CBC Toronto Monday morning. Emergency crews were called to the airport shortly before 6:30 p.m. ET Sunday for the fire on a “secure side” of the terminal, meaning an area beyond where travellers have passed through security and U.S. customs, Peel police Const. Akhil Mooken told reporters at the scene Sunday night. Ganogiannis confirmed the fire broke out at a duty-free shop in the U.S. departures area. She said the fire alarm sounded at 6:22 p.m. and the fire was out at 6:40 p.m.
Pictures taken at the scene Monday morning showed work crews from the airport, as well as officials with Pearson Fire, inspecting an upper part of the wall that appears to house a storage cabinet near the back of the shop, which was sealed off with police tape. A strong smell of smoke persisted throughout the terminal. The blaze was quickly extinguished, but heavy smoke hung in the air during the incident and some travellers were treated for smoke-related injuries, Mooken said. All flights to the U.S. scheduled to leave from Terminal 1 Sunday night were cancelled and a portion of the terminal was evacuated. Twenty-nine flights were cancelled due to the fire, Ganogiannis said. 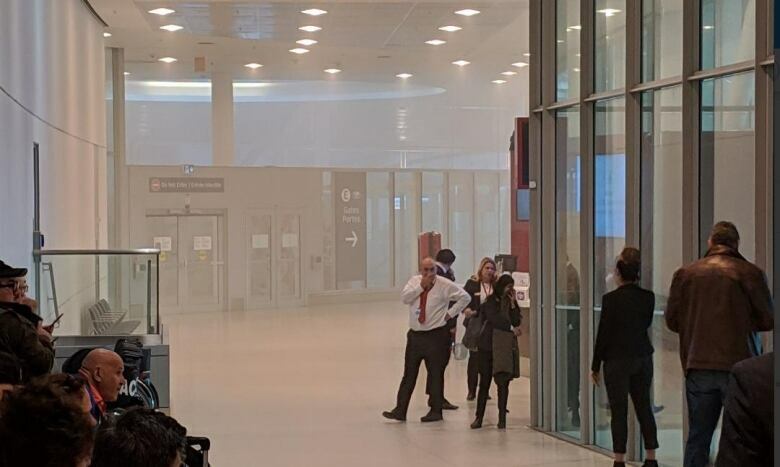 The fire activated the sprinkler system, which led to a “significant discharge of water” that partially flooded the departures area, she said. Smoke also drifted into the international arrivals hall, she added. The incident led to about 50 planes being held on the tarmac Sunday night before passengers were allowed to disembark, Ganogiannis said. That alone affected about 10,000 travellers, she said. Ruotong Zhai, who flew to Pearson from Hong Kong Sunday night and was expecting to get on a connecting flight to Atlanta, where she attends school, stayed at the airport overnight. She said when she got off her flight and tried to make her way to her connection, smoke was in the air. “We waited there, and they said they will let us go when the smoke has dissipated, but it didn’t, and the smoke was coming slowly at us,” she told CBC Toronto Monday morning. Despite the smoke, passengers remained calm, she said. Zhai could not get an early flight to Atlanta. She is rebooked for an evening flight, meaning she will miss a day of classes. Brent Larsen flew in from Kamloops, B.C., Sunday evening and was expecting to get on a flight to Indianapolis. He got a hotel room and returned to the airport early Monday to see about rebooking his flight. He said airport staff did not provide information for passengers about where to go or what to do. Larsen was also looking for his luggage ahead of his rebooked flight Monday morning. Ganogiannis said airport staff will have an incident debrief starting today to discuss the response to the fire, including what could have been done better or if improvements can be made to the airport’s emergency plan.